I was so startled by that reply – still am! – and as you can imagine, I won’t let him forget that he did nothing to help me or comfort me. He argued that there was nothing that he could have done, and he was surprised that I felt like I needed to tell him that I was sick when everyone in the building would have known. Maybe it’s a Mom thing. There have been times when I have called my Mom, and she has driven from Hamilton to take care of me, even when we lived in Montreal. Over the years, my brother and I have often relied on her to take care of our sick kids when they need to stay home from school. If I had called out to my Mom that night, I can assure you that she wouldn’t have stayed in bed and barked back at me. She would have done something, and it would have been just the right thing. That mother instinct clicked in last Tuesday when I got a text from Jacob’s advisor. He wanted to let me know that Jacob was at the health centre with a headache and upset stomach. As I sat at my desk, I felt sick. There I was, three hours from my baby when he needed me most. So I did what had to be done. I hopped in the car and drove to Lakefield. I think he was happy to see me. He hugged me a bit longer than usual, and we had nice talks during the first hour that we drove back that night, before he slept the rest of the way. I felt like I did the right thing, especially since he was scheduled to take the bus home the next day and all those kids’ parents can thank me for not putting a sick child on the bus with their children. But guess what? When I asked him about his experience, and I was hoping that he would tell me that he wished I were there? That he needed his Mom and it was hard to be away from home? There was none of that. He liked that his advisor drove him to the health centre when it is only across campus. He liked that there was a ginger ale by his bed when he arrived. And he liked that the nurse brought him chicken noodle soup. In fact, his advisor’s wife also made him chicken soup for dinner so he had soup twice. And his biggest news was that the room at the health centre included his own bathroom and – ready for this? – a flat screen TV. As he recounted his day, with his face scrunched against the side of the seat in the car looking at me as I drove, I swear he had a little smile. I was just one in a series of people to care for him that day. Once again, I had to let it settle in. He was sick but he didn’t call me. He made it through the day and there were other people there for him. I have to get used to that; in fact, I have to be happy that he is learning independence. At our recent Heads and Chairs conference, Yong Zhao joked that the purpose of education should be to ensure your children don’t end up in your basement after they graduate. Boarding school is the best preparation for independent children. I drove him back to school on Monday. I didn’t have to, I could have put him on the bus, but I realized how much I like that three hour drive and the time together to talk. I long for that break in the silence when he says something that begins with, “Did I tell you about.” When we drove onto the campus, and it was dark, he was excited to point to the health centre (and tell me again about the TV) and tell me about the other buildings. I reminded him about the opening day drop off and how everything was unfamiliar and then I started a sentence and caught myself. I said, “And now it feels like you’re coming home”. I choked up a bit at that thought. We looked at each other hard, and he nodded. Lakefield is his home. I’m glad you wrote the story out so I can clarify some facts: i. I did get out of bed; ii. you had closed and I think locked the bathroom door, which opened in and right on you because the toilet was beside the door; iii. when I said “I know” I was standing outside the bathroom door; knowing you were sick but not being able to do anything for you because of the door; iv. “I know” was intended to convey “I know and I’m here”, but the “I’m here” part was presumed because I was saying it outside the door. Perhaps you should add all this as a footnote. Glad after spending more of our lives together than apart that we’ve figured this one out. Your blog is a good thing. He is right, as this is an opportunity for over 100 people to hear about the strategic directions of our national organization. So tonight I want to move through these quickly before I tell you about what I really want to talk about. There are four priorities in our new strategic plan – National Standards and Accreditation; Professional Development for Leaders; Research and Resources; and Permanence and Strength. There are exciting initiatives under each area, including things like our CAIS Top 12, which was implemented in January and has been hugely successful since it is based on our Standards, and it is research that becomes a PD gift to you, designed to save you time and improve you and your school. – Of the 16 girls schools in Canada, 4 are run by men. None of the boys schools is run by a woman. Action Item: When you see a position advertised, encourage a woman to apply. 2. Mentors – I am hearing that people are hungry for mentors who have time to invest in them and their schools. CAIS is implementing a mentorship program that will go to the Board this summer, the Heads and Chairs in October, and be launched in November. George Rutherford, who was here with us this week taking the Coaching Module, and who will teach the Governance Module in Vancouver this fall, will be overseeing this initiative. Action Item: Look for details this fall and either get involved or give me feedback on how it can meet your needs. 3. Our Summer LI has been the strongest yet. On opening night, I introduced Canada’s best faculty, but one member had not yet arrived. I am pleased to present David Robertson, Head of Shawnigan Lake School, who is here to teach the Next Step Program. David arrived after midnight, but was up and raring to go for a 7:15am start, which is 3:15 am according to his body time. Thank you for joining us, David. Please can we show our appreciation for all of our Summer LI faculty. – There is huge momentum with CAIS’ leadership programs. – Engagement is higher than ever. – There is a real focus on making the program really relevant to our jobs and schools. – Always great to be with colleagues from all over Canada. – There is a more intentional focus on learning. You can feel it. Ultimately, our goal as a national organization is learning and leadership. Our goal is to make our schools stronger for our 45,000 students. As we discussed in our National Forum – if you want to change schools, you change culture. And how do you change culture? You change conversations. If our host, Paul Kitchen, were here, he would say that each year, his job is to make his school a little bit better. Well, if you know Paul, you know that he would first say that he is a small, poor country school teacher…. But he would also say that the role of the Head is to ensure that you make your school a little bit better every year. And for those who have been to the campus in the past, you can see that RNS has definitely made great strides under his leadership. Paul would also say that CAIS – and its accreditation and PD and now its research – plays an important role in that continuous whole school improvement. It is a partnership. So my final action item, before we turn it over to our largest graduating class ever, is to encourage you give us your feedback. Jo-Anne, our new Director of Programs, has spent her time this week listening to your ideas on how to improve our programs. I also need you to spread the word about your learning here. Tell others about your experience and – most importantly! – apply your learning to improving your school for your students. In closing, I believe that our organization is strongest when we work together, in partnership, with our colleagues and friends from across Canada. And I look forward to another great year. p.s. Check out the PD section of our website for resources and photos. Imagine this – it is 8:30pm on the evening before a long weekend. A woman wearing a business suit, lugging a laptop bag and purse while pulling a suitcase, is skipping stairs up the escalator and sprinting through the Atlanta airport. Her heart is racing. She knows that there is not another flight this evening because she has already done that research in the first airport when she knew her first flight was delayed. She knows that she does not have a moment to spare. She is desperate to get home because her 12 year old daughter is having a birthday party sleepover with her friends and cousins. Do you wish this story ends a certain way? I know I did. Sadly, last Thursday night, despite my best efforts, I got to my gate six minutes after my connecting flight had shut the doors and so I spent an unexpected night in Atlanta. Somewhere just after 8:30pm, when I had texted my husband and kids with the update that I wouldn’t be home, I got a text from my colleague Sarah who asked if I made my connecting flight. With all of her international travel, she knows this scene all too well. I replied, “PPP.” This has become our code for rotten news. It means: Pity Party Please. The whole concept of living in the moment does not seem to apply at these times. In fact, travel mishaps are actually some of the most challenging parts of my job – flight delays can leave you in a strange city, late at night, alone, and homesick – how do you snap out of wallowing in that woes me whine? That night provided another reminder of the need to focus on what is good. And I mean to really train your brain to shift from that unbecoming state and instead think about gratitude. In Thursday’s case, I had had an amazing day. A group of educational leaders of national and international organizations met in Ashville, North Carolina this week for an Independent School Research Summit. It seems that all schools are hungry for research and some schools are in trouble, so there is a sense of urgency for associations to increase the efficiency and effectiveness of collaborative research. At this time, all of our associations – even the big ones! – recognize this challenge: we have big questions and small shops. As those of you who work with me know, I really believe that we can do things better together, so I was grateful to be invited to participate. In our next news letter, I will give you a summary of the great work underway with my colleagues at NAIS, TABS, NCGS, CASE, NBOA, CSEE, AISAP, SSATB, INDEX. There is an exciting new initiative, and CAIS is proud to participate in this North American effort to identify possible opportunities for larger-scale research about independent schools. Our next meeting will be in Washington. I might drive. And I will definitely bring the kids with me. We are currently running a FAM Tour. For those who don’t know what that means, (and until two years ago, I didn’t either!) it refers to a group of international agents touring schools to familiarize themselves with our schools and Canada. The majority of our boarding schools, as well as most universities, now pay international agents to find mission-appropriate students. It was just the best day. The agents were in awe. They couldn’t believe the campuses, the residences, the facilities and most of all the warm and huge reception they received at each school. At one point during a video, Gardiner and I turned to each other with tears in our eyes. It sounds dramatic, but it was a dramatic day. I felt very proud to be part of CAIS and associated with these amazing schools. It was a fantastic day. Schools and agents were all very happy. 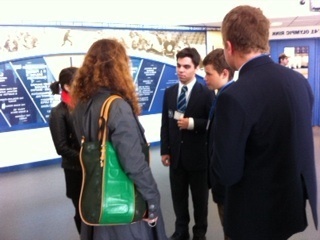 The agents will tour 18 of our CAIS Boarding Schools across Canada. Next week, I get to meet them and drive the van to Shawnigan, Brentwood, St George’s, St. Margaret’s, and SMUS. How fun is that? Makes me feel proud that we are showing off our country – and our CAIS schools! – to people who can deliver us the top students from around the world. 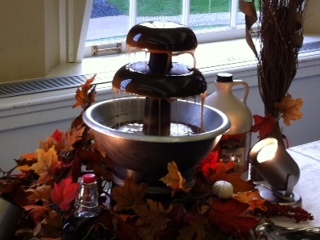 ps – As I sit in my office preparing for our Heads, Chairs and Business Officers Conference, which begins tonight, I must admit: Alyson’s note has made me dream of amazing food, especially maple syrup fountains (check out the photo below). pps – I hope our five BC boarding schools read this blog and feel the pressure to wow us with their food…. no pressure…. For the past three years, we have had a dozen new Heads in our CAIS schools each year. For anyone interested in future leadership positions, you should note that that’s an annual twelve percent turn over. Our schools are in good hands with this year’s amazing bunch of leaders. Welcome to the national organization of Canada’s top schools! This is my third annual listing of new Heads, so this year – to shake things up a bit – I will add that one of the following includes a video introduction….